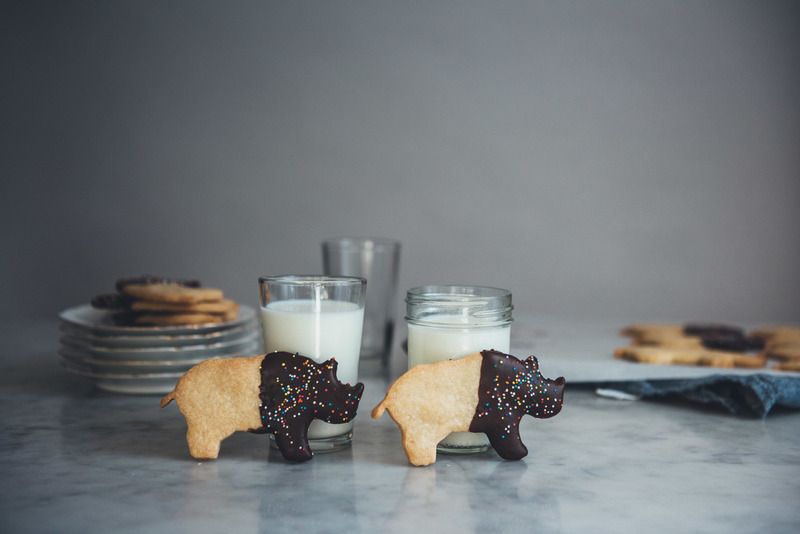 They are really just shortbread cookies dipped in chocolate and covered in sprinkles, but I thought it would be fun to cut them into cute rhino shapes. Though to be honest, I had a helluva time with their tiny little tails, which kept ripping off. But some fancy patchwork later, and you can't even tell, I hope? You of course can cut the cookies into any shape you desire, be it trees, snowflakes, or the classic circle. The crunchy, buttery shortbread would be delicious in any form. Hope you guys have a wonderful holiday, however you like to celebrate! Makes 12 to 24 cookies depending on how large you cut them. In the bowl of a stand mixer fitted with the paddle attachment, beat butter, sugar, and salt together on medium speed until thoroughly combined, about 1 minute. Add the vanilla and beat for another 30 seconds. Add flour and mix on low for another minute until dough just comes together, at this point it will be fairly crumbly. Turn the dough out onto a clean counter and, if needed, knead it a few times until it starts coming together. Form the dough into a ball, gently flatten it a little, and wrap tightly in plastic. Chill in the fridge for 20 minutes. Once the dough is chilled, remove the plastic wrap and transfer it back to your counter. Place a piece of parchment paper on top, and roll it out until roughly 1/4 inch thick (alternatively, you can also roll it out in between two sheets of parchment paper). Cut the dough with your cookie cutter of choice and, using a bench scraper, transfer each piece onto a parchment paper lined baking sheet. Collect the dough scraps and continue rolling and cutting until you have used up the remainder. Turn the oven to 350 degrees F. While your oven is heating, place the baking sheet(s) of cut out cookies in the fridge to firm up. When ready, bake cookies for 15 to 18 minutes until slightly golden around the edges. Let cool to room temperature. Once cookies have cooled, place chocolate chips in a heatproof bowl over a small saucepan of water. Bring the water to a gentle simmer and melt the chocolate. Dip the cookies in the chocolate, top with sprinkles, and let cool until chocolate sets. Enjoy!